Chinese New Year Holiday – House arrest! It’s that time of the day when I need to talk, share my fears, voice my emotions and just be heard. That’s exactly when I switch on my laptop and start writing a post. My blog doesn’t judge, doesn’t voice it’s opinion, it just lets my thoughts flow as my fingers effortlessly type away. Well its been quite a slow and lazy Chinese New Year holiday for us. I love this holiday coming soon after the long Christmas break, helps me revive myself after all the Christmas and holiday festivities and school thereafter. I love resting at home and going for an occasional lunch or dinner or maybe catch up friends and their families. This New Year however we were under house arrest! It started with my younger son who caught some sort of virus floating around. 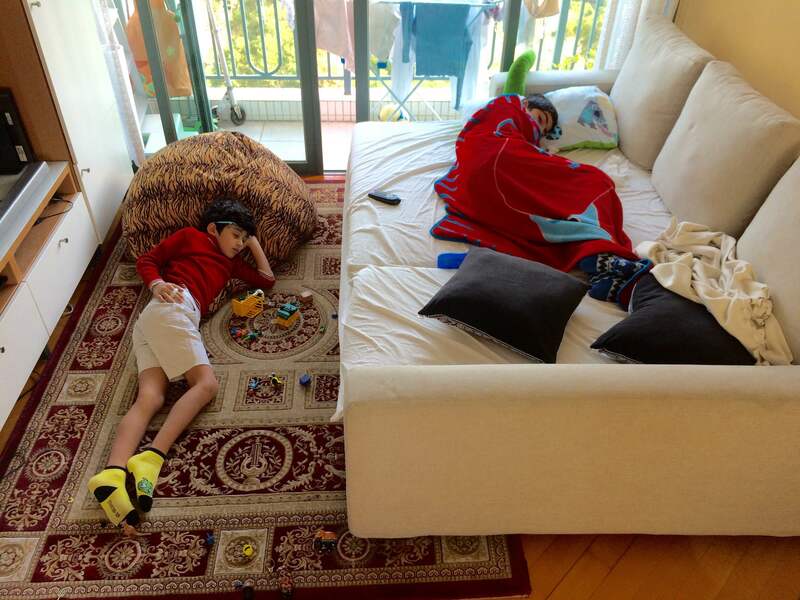 After all “The Little Explorer” bit that he did hiking up the tallest mountain in Hong Kong and all, he came down with a bad case of flu. And when he falls ill the world has to stand still. Always been the ‘attention seeker’ in my family, it gets worse when he falls sick. My little bundle of joy always at his passionate best when it comes to playing and making mischief, becomes equally passionate when unwell and bawls his heart out! Well the loud crying has stopped now that he is almost turning 8, but the asking for attention remains and can wear out the most dedicated of mums, me included! Thankfully after 4 days of bed rest he is back on his feet, a much thinner version though, my poor baby. But the virus has now been transferred to my elder son who has the complete opposite reaction. He likes to rest, sleep and basically just be left alone and if I don’t go and ask him if he needs anything I think he would continue doing just that. Seems like we are under house arrest, no lunches or dinners outside, no hiking or going for a day out and now to make things worse I have caught the virus! Never the one to be bogged down by an illness I had planned to take full charge of this deadly pest and show him the door once and for all! That was yesterday, today the virus has me in its complete grips with every part of my body aching and my eyes barely staying open. Oh! Did I forget to mention that my younger son has inherited some of my genes….. in the ‘attention seeking’ department? But I would never trouble my boys, it’s only my husband’s care and warmth that I seek! Two more days to go before the end of this holiday. I am tired of the illness, tired of staying at home and watching movies and sleeping. I am keeping my fingers crossed for a healthy and happy week starting Monday. Hope you all had a much better and more eventful week than mine. Aye, get well soon 🙂 Hope the year has a lot of great stuff stored ahead ! Get thank you so much Shreya….your good wishes has almost got me out! Hey, by now you are already well along with the family. It upsets plans when the whole family is under house arrest during the Chinese festival. It must be fun, though, in HK with Kung Shee fat Choy being the national festival with fire works and all. You bet! Good to see you come out of hibernation and to receive all these comments! Keep it up!